It's Kwanzaa-time! Light the candles on the kinara! 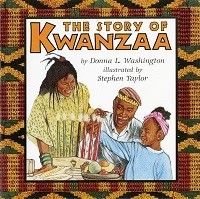 Share the joys of Kwanzaa with a little one! It’s Kwanzaa-time! Light the candles on the kinara! Fly the bendera, and tell stories from Africa! The festival of Kwanzaa was originated by Dr. Maulana Karenga to honor the customs and history of African Americans. The seven principles of Kwanzaa, called the Nguzo Saba, serve to remind African Americans of the struggles of the past, and also focus on present-day achievements and goals for the future. Activities at the end of the book include making your own cow-tail switch and baking benne cakes.